Riviera Perimeter Outriggers are fashionable, classy perimeter fixtures designed to outfit retail stores and trendy boutiques. The Riviera Perimeter Outrigger is constructed of raw steel and shows all assembly marks (welds, cuts, and joints). The Riviera Perimeter Outrigger is also clear coated for superior protection. The typical appearance of gunmetal gray on the Riviera Perimeter Outrigger gives this line of fixtures its 'custom boutique' feel at a very affordable price. Riviera Perimeter Outriggers also feature stylish finials. The Riviera Perimeter Outrigger offers flexibility for showcasing your merchandise, giving you endless possibilities with setting up and customizing all your store fixture displays. Raw Steel Faceout - 12"
1/2" x 1 1/2" x 48"
Rectangular Raw Steel Hangrail Bracket - 12"
Rectangular Raw Steel Hangrail Bracket - 3"
Palay Display's Riviera Perimeter Outrigger is the perfect display for a variety of retail environments. The Riviera Perimeter Outrigger looks fabulous in boutiques, clothing stores, and other specialty shops. If you can't find the right Riviera Perimeter Outrigger, please chat online or call one of our knowledgeable sales staff who can assist you. 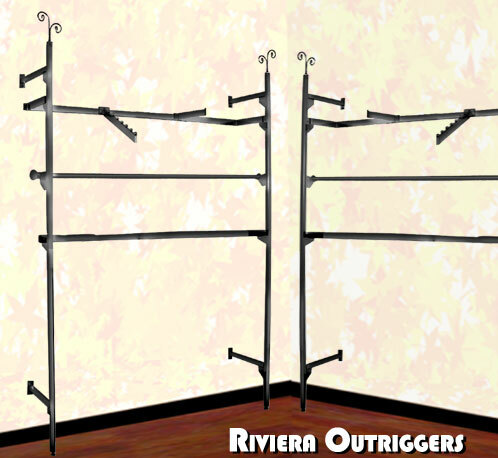 The Riviera Perimeter Outrigger gives a trendy look to your store fixture displays. The gunmetal gray color of our Riviera Perimeter Outriggers gives a classy, fashionable quality to your store. The Riviera Perimeter Outrigger is a great choice for your retail setting. The Riviera Perimeter Outrigger shows assembly marks such as welds, cuts, and joints, which gives this display a custom boutique feel. Palay Display's Riviera Perimeter Outriggers are affordably priced, making it a great option for a mixture of different stores. If you can't find the perfect Riviera Perimeter Outrigger, please chat online or call one of our knowledgeable sales staff who can assist you. Interested in making your store displays more customized, but are unsure where to start? Try a Riviera Perimeter Outrigger. The Riviera Perimeter Outrigger is a great place to begin, adding a personalized, classy touch to your store fixtures and displays. The Riviera Perimeter Outrigger also features stylish finials, sure to impress your customers. Riviera Perimeter Outriggers add a level of class and sophistication to a multitude of store fixtures and displays. Try a Riviera Perimeter Outrigger today! If you have a boutique, clothing store, or other specialty shop, you have a need for a classy Riviera Perimeter Outrigger. The Riviera Perimeter Outrigger, with its gunmetal gray finish and assembly marks showing, adds a personalized touch to your shop. If you can't find the right Riviera Perimeter Outrigger, please chat online or call one of our knowledgeable sales staff who can assist you. The Riviera Perimeter Outrigger, clear coated for superior protection, is durable and economical. This makes it a smart choice for a variety of retail environments. If you can't find the right Riviera Perimeter Outrigger, please chat online or call one of our knowledgeable sales staff who can assist you.